Trio de Brooklyn qui a pris d’assaut les scènes en coupant court à la médiocrité, en allant directement dans le vif de la musique . Leur deuxième album » Blood from a stone » ( juin 2014 ) vient de sortir chez le légendaire label garage : Norton Records ! 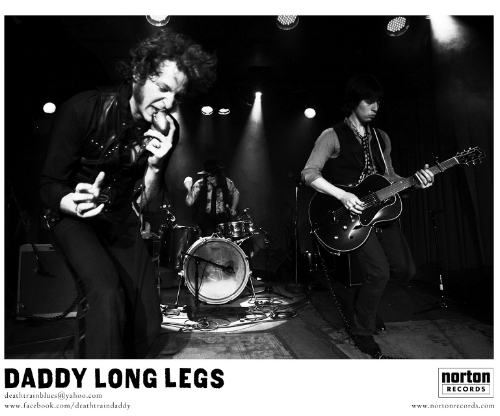 DADDY LONG LEGS, the rock n’ blues group, derives its moniker from its harmonica-blastin’ frontman. Daddy Long Legs, the aforementioned wailer, is joined by slide-guitar driving Murat Aktürk (born in Ankara, Turkey) and legendary NYC trap master Josh Styles, who attacks his kit with a whip and a maraca, although not necessarily in that order. The trio has taken the music scene by storm, with alarms sounding throughout the East Coast and reverberating across the globe, as they cut through the mediocrity, directly into the meat of real music—from the hip and to the heart. DADDY LONG LEGS presents here their debut full-length Norton label offering, EVIL EYE ON YOU, a showcase of the trio’s finest original proclamations, set in a sparse black and white selection that is meaty beyond definition.